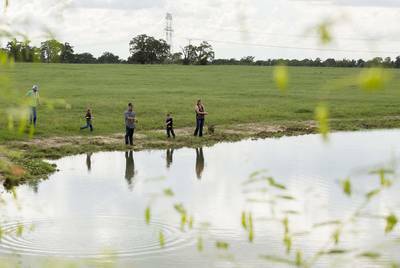 Despite the pop culture archetypes of Texas that feature oilmen and cattle drives, the Calhouns have become a minority in Texas, which is now home to five of the 15 largest cities in America. “Having the utility corridor is ugly, but we can still work around it,” Randa Calhoun said. 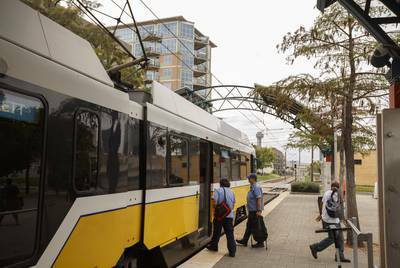 In Dallas and Houston, officials and business leaders have cheered the project and the economic development Texas Central promises to spur with the construction of its stations. 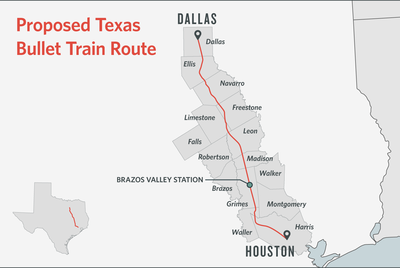 “Texas values collide in fight over Houston-Dallas high speed rail” was first published by The Texas Tribune, a nonprofit, nonpartisan media organization that informs Texans — and engages with them — about public policy, politics, government and statewide issues. This story by Texas Tribune urban affairs reporter Brandon Formby was produced in partnership with Curbed for The United States of Texas and California. 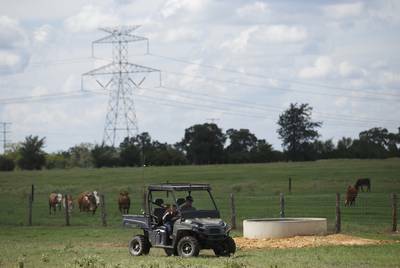 Editor’s note: This story is not available for republishing by Texas Tribune media partners. This article originally appeared in The Texas Tribune at https://www.texastribune.org/2018/10/24/texas-values-collide-fight-over-houston-dallas-bullet-train/.